The title of this post may be the most understated of understatements. Or, maybe, I just need about 5 hours where no one speaks to me. One of those things. Isn't that beautiful? Doesn't that make you feel relaxed? Yes? You're crazy. I'm not sleeping in that. What if it gets really windy? What if a shark grows legs and walks up the stairs? What if there's an axe murder? No thank you. Vacationing with other people is an interesting experience. As a kid, you're kind of stuck with whatever your family does because they're grown and paying. As an adult, you have to navigate other people's vacation styles which may not be anything like yours. Some people are go, go, go, go, go, go, go on vacation. They want to see and do everything! They want to go out and enjoy the night life! That want to experience all there is to experience. Those people make me tired. Sure it's nice to go out and see the place you're visiting. You should take in the sights and experience the culture. But you should also relax, because relaxing is the entire reason you would go on vacation in the first place. Leave when you say you're going to leave. THIS is my crazy part of the vacation. If you say we're leaving at 5 we should leave at 5. I've got issues with time and yeah... It's worse if there's an airport involved. I need to be there early to get through security, eat some non threatening-been-screened-for-bombs food that costs too much and then scrutinize the plane as if I have any idea what I'm looking at. Eat. Food is important. Very important. Maybe more important than it should be (that's a post on its own) but food. I don't need breakfast. That also means by 11:30 I'm going to need lunch or someone is getting punched in the throat. Nightlife. I like being outside after the streetlights have come on occasionally. But I do not want to go to the club. I didn't want to go to the club at home, I do not want to go to the club now. We can go to the casino. I can lose $20 - 30 on the slots and call it a night. Woooooo hoooooo! Do something - Notice the some thing. Not all of the things. Just some of them. And space them out. It's ok to just veg. One of my favorite vacation moments ever was hanging out in the room in Vegas, eating and watching the Keno channel. Yes the Keno channel, that was quality tv especially after walking up and down the strip. Do not make friends with strangers - We can be cordial. Hello, where are you from (I don't really care) enjoy your time (never speak to me again). I'm not trying to spend time on vacation following behind some strangers. That's how you get hacked up and stored in various parts of the hotel. Nope. I need a vacation. Or at the very least to walk around the food court once. That'd work too. The title of your blog caught my eye and I'm glad I stopped by. I couldn't stop laughing the entire time I was reading your post. The funny thing is, I agree. The last vacation I've been on was my honeymoon almost 5 years ago so I feel your pain. Welcome D! Glad you liked it. We both need vacations! 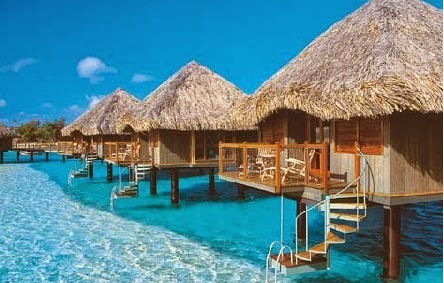 Bek, I would do anything to go on a tiki hut vacation....sharks and ax murderers be damned! I'm nodding along with all of the vacation points...the point is to relax not do everything! Also, I went on vacation with another couple once and it was THE worst experience..never again. See!!!! Other people will mess up all kinds of stuff.